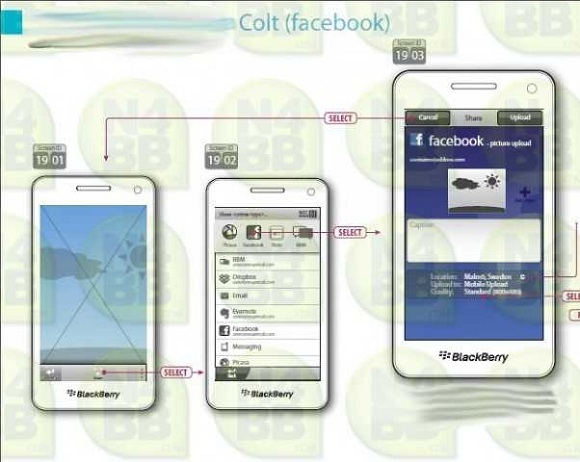 We have seen many leaks related to the BlackBerry 10 OS and the latest one shows us how the sharing on the Facebook for BlackBerry 10 would look, feel and work. As you can see above, in the first figure, we cans see that there is an image which the user is viewing and he wishes to share it with on Facebook. So he selects the share button and then select the Share UI appears which looks nice. Here the user has an option to select the destination he wishes to share which could be Facebook, BBM, Picasa, DropBox, and much more. In this case it is Facebook. The user also has an option to select the quality of image that he wishes to upload on Facebook. The whole Share UI looks cool and the Facebook upload of images, links, and web pages looks simple too. We hope the design to develop more as the OS still has almost half a year to go until it is launched on a device. Did you like it? Do let us know in the comments section below.